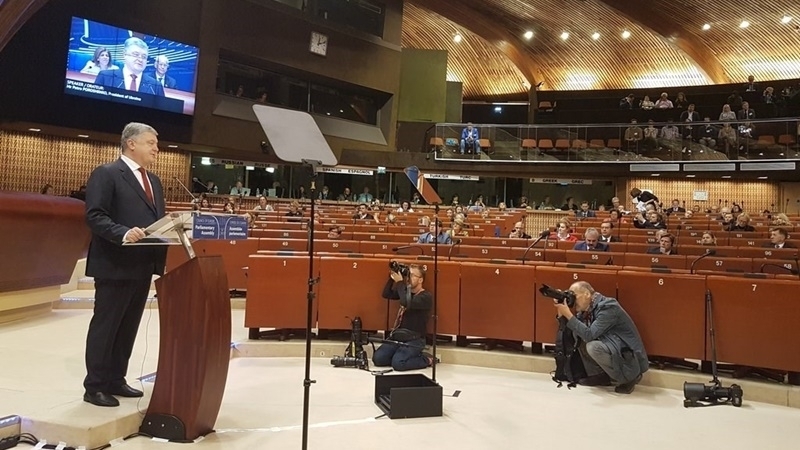 Speaking at a meeting of the Parliamentary Assembly of the Council of Europe, President of Ukraine Petro Poroshenko described the situation in the occupied Crimea quotating the final word of the Deputy Chair of the Mejlis of the Crimean Tatar people Akhtem Chiygoz in the court. In his opinion, Chiygoz’s words clearly show the nature of crimes committed by the Russian Federation on the Ukrainian peninsula. The President went on providing the example of another Deputy Chairman of the Mejlis Ilmi Umerov. “This hero of his people first experienced the methods of punitive psychiatry of Russia, and now the "court" sentenced him to 2 years. The scale of crimes and delicts committed by the occupying power in the Crimea testifies to the open disregard for international legal obligations by Russia, recognized as an aggressor under the UN resolution", Poroshenko stated. The Head of Ukrainian State expressed his gratitude to all members of the Assembly for a clear position on the issue of the occupied Crimea and solidarity with Ukraine. Today, October 11, President of Ukraine Petro Poroshenko is on a working visit to Strasbourg, at the plenary session of the fall session of the PACE, where urgent debate on Article 7 of the Ukrainian law "On Education" will be held at the request of the Hungarian deputies. Within the framework of his visit, Poroshenko is scheduled to meet with the Secretary General of the Council of Europe Thorbjørn Jagland. Furthermore, he is expected to participate in the opening ceremony of the "Star of Heavenly Hundred" near the Palais de l'Europe. Earlier, QHA reported that on September 11, the so-called Supreme Court of Crimea fully supported the charge against the Deputy Chairman of the Mejlis of the Crimean Tatar people Akhtem Chyigoz which was requested by the prosecutor's office. On August 9, in his last word in the "court", Chiygoz announced that he would accept the verdict for the entire Crimean Tatar people.